Product Description:In order to meet the particular designs of the customers, we provide them a personalized array of Die Cut Gaskets. This Die Cut Gaskets is used to fill the space between two objects. Our Die Cut Gaskets are extensively used to prevent leakage between the two objects under compression. 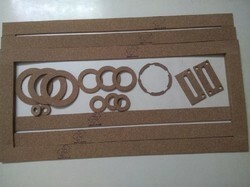 We are providing high quality die cut gaskets. These die cut gaskets are manufactured using latest technology, these products enables us to meet the dynamic demands in market. Face: Both flat And raised face. 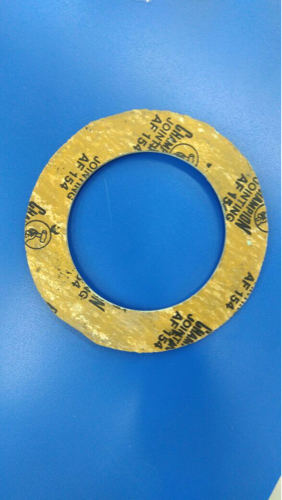 Cut gaskets of all shapes and sizes are available. We stocks a wide range of standard pipe flange gaskets to IS, ANSI & DIN standards. These are available in both flat & raised face. To meet the various requirements of the customers, we are involved in offering a wide assortment of Die Cut Gasket. Even Rubberized gaskets are also ensured quality as per IS 4253 . Waterjet cutting can deliver near net final shapes for application in any kind of machinery. Using this technology, you can achieve near-net shapes including holes on any materials of any thickness. Since the process leaves no heat affected zone, it is highly advantageous for delivering preciselymanufactured machine parts. We are offering a huge range of Elastomer Ready Cut Gaskets of Champion Make and PTFE Envelope. These products are manufactured by high class of raw material as per the client requirements by highly experienced workers. Our product range is widely appreciated for their fine quality and high durability. These gaskets can be used in various procss industries size starts from flange size 1" to 24"
Whatever your requirements, industrial rubber specialist J-Flex can help with a superb range of die cut rubber gaskets.